SADDLE BROOK, New Jersey -- Police have a warning for homeowners in a New Jersey community that has been targeted by burglars. 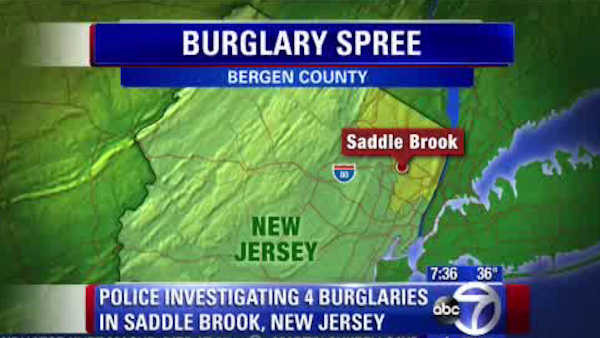 Authorities are investigating four break-ins that happened on Friday in Saddle Brook. Police say the burglars entered by forcing open windows and doors, and then took cash, jewelry and electronics. Authorities are urging residents to remain vigilant, report suspicious activity and have motion sensitive lights on their property. Police have not determined whether the burglaries are related.